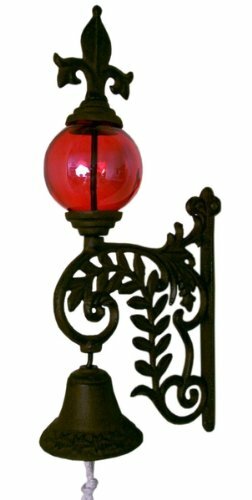 Iwgac Home Indoor Outdoor Cast Iron Bell With Glass Gazing Ball Hanging Wall Decor Red by MJ's Western Outpost at The Net Stores Network. MPN: 0184S-0101R. Hurry! Limited time offer. Offer valid only while supplies last. Cast Iron Bell with RED Glass Gazing Ball - Real brilliant red glass gazing ball is so beautiful against the rust color of the cast iron bell. Cast Iron Bell with RED Glass Gazing Ball - Real brilliant red glass gazing ball is so beautiful against the rust color of the cast iron bell. Measures 15" x 7 1/2". If you have any questions about this product by MJ's Western Outpost, contact us by completing and submitting the form below. If you are looking for a specif part number, please include it with your message.